New Aerial Photo of 112 and 115 Deerhaven. 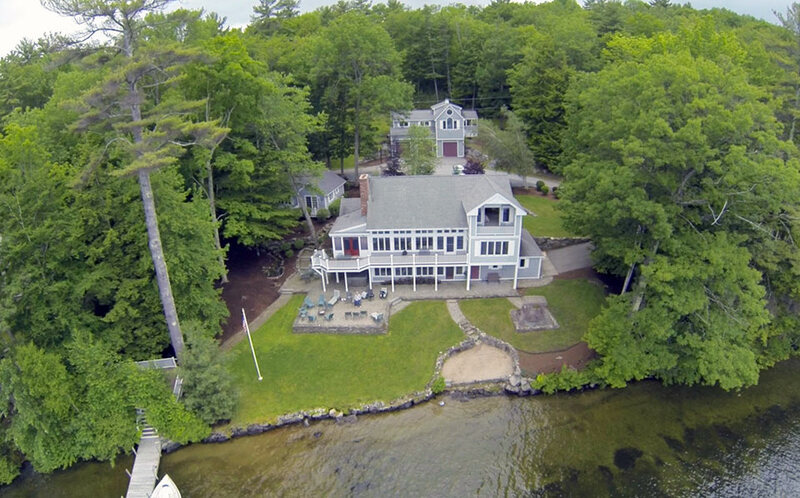 A Winnipesaukee Estate Property with 3 Residences. View the new aerial photo and listing details of 112 and 115 Deerhaven Road, Moultonborough. The 3 homes on the 5 plus acres of this property offer an ideal way to enjoy the lake while entertaining family or friends. The casual luxury of the property includes great screen porches, large living rooms and bedrooms, and a kitchen or kitchenette in each of the 3 homes. The 200 feet of waterfront and the location near the end of a quiet road offers privacy. The location on the lake is central and ideal for boaters who want to visit the lakeside towns' amenities. The very large bay in which it is located offers great privacy from boaters and a quiet bay for water-skiing. Boat traffic at 112 & 115 Deerhaven stays a long distance from the property, giving you the quiet enjoyment of the lake most lakefront buyers want. View the new video of 183 Wentworth Cove, Laconia, a new construction home for sale newly listed for summer 2013. This video features the home on a rainy day. Check back next week for new, sunny day video footage! While the lake is beautiful in any weather, the sunny days are the best for seeing the lake and mountain views at properties such as 183 Wentworth Cove, Laconia, NH. This home was built by Gary Cartier, a premier Winnipesaukee builder who has also built homes on nearby Governors Island. You can view all Winnipesukee real estate here on my website. Fournier Builders LLC and 60 Ruppert Road, Moultonborough Featured in Builder+Architect Greater Boston Edition, July Issue. A Winnipesuakee Home and its NH builder are highlighted in Builder+ Architect Magazine. 60 Ruppert Road presents a unique opportunity to own a prime waterfront property priced under the town assessed value. Congratulations to Mike Fournier and Fournier Builders LLC of Goffstown, NH for being featured in the prestigious Boston Builder+Architect Magazine's New Hampshire Edition. Three of the Fournier Builders homes are showcased in the July 2013 issue, including 60 Ruppert Road, Moultonborough NH. This elegant, custom-built Craftsman Style home is sited in a protected sandy bottom cove with a private dock, clear water and level access to lawn and gardens. As a testimony to the fine workmanship of Fournier Builders, the Ruppert Road homeowner stated " The best thing that homeowners can say about their builder is "Yes, we would do it again". After 10 years of living in a trouble free home built by Mike Fournier, we are ready to down size and have Mike build our next home. Our first experience with him was just that good. His great organization of sub-contractors, attention to detail and passion for fine finish work made building our custom home an enjoyable undertaking." Call Nicole at 603 707 7575 to request a copy of the July issue of Builder+Architect Magazine or for listing information on 60 Ruppert Road, Moultonborough NH. From an Era of Bygone Grace....An Estate Property with 266 feet on Winnipesaukee. This Winnipesaukee classic cottage was designed with 5 upstairs bedrooms, including maids's quarters. A vaulted Living Room with fireplace below opens to a West-facing porch. From an era of bygone grace 124 Alpine Park Road, Moultonborough, offers the opportunity to transcend time. A long, driveway that leads to the 2 homes on the property and offers complete privacy from the quiet road on which the property is located. Your first glance at the magnificent main house/cottage with great architectural "lines" adds to your sense of an era of grace! 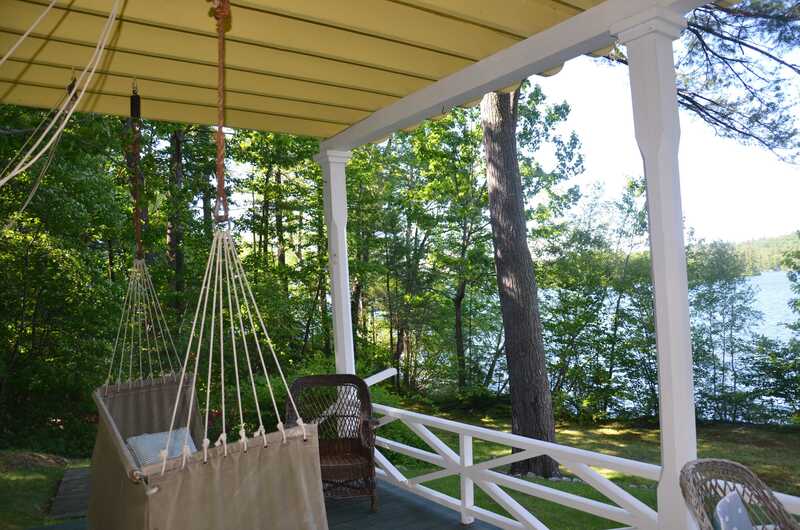 The lakeside porch has views over your large yard (a total of 2.33 acres).This 2.33 acre parcel, in an area of other estate Winnipesaukee waterfront parcels, is imbued with the peaceful feeling of nature! Classic Lake living is apparent in its every aspect! 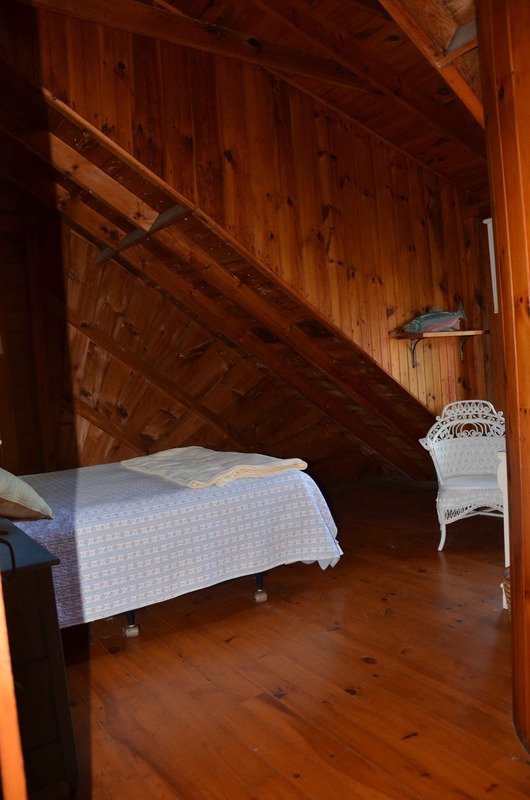 There are five bedrooms in the upstairs of the main lake cottage. At 124 Alpine Park, Moultonborough's lake cottage you will find high ceilings, knotty pine walls, pine floors, and many windows for cross ventilation. These are some of the characteristics of summer cottages that still influence the design of contemporary lake homes today. The detached "barn" which has been converted to charming year round quarters for the current owners has additional sleeping quarters in its upper level. A kitchen and an open concept living area with a fireplace, now used for a woodstove, is on the entry level. The living area leads to a large den that opens to the laundry room and to a sun porch and deck. 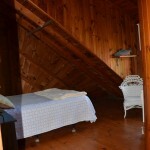 This converted barn has high ceilings and the original hardwood floors, which are in beautiful condition. The key elements of lake house warmth are yours in both the converted barn and classic lake cottage. 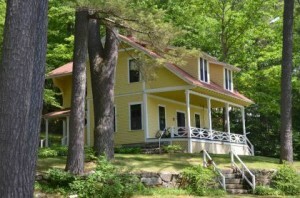 Also located on this Winnipesaukee estate parcel is a detached garage and bunkhouse. The lakefront near the distinctive boathouse, is perfectly level and perfectly, absolutely private! With 266 feet of prime Westerly facing shore front, and a lakeside lawn with ample room for outdoor recreation, this property will win your heart. 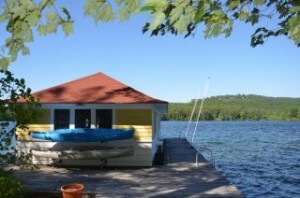 Enjoy the westerly breezes from the wide docks along the side of the boathouse or from your porch. The gentle music from the Center-Harbor bandstand can be heard on Friday evenings from your docks as your own private sitting area! Enjoy the view of Gunstock Mountain on one side and the picture postcard view of the village of Center-Harbor on the other side. 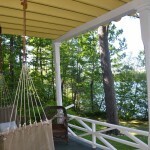 Alpine Park's Swing on the Classic Lakeside Porch. This location in Center-Harbor Bay is quiet, as Center-Harbor is the smallest of all the Lake Winnipesaukee-shored towns. This location gives you a unique vantage point to enjoy being less than 10 minutes to several gyms, a book store, and town tennis courts. Golf courses, swimming lessons, horseback riding lessons are within a 15-20 minute car ride. Restaurants, shops, library and post office are all within 10 minutes. View photos at NicoleWatkins.com. Please check back soon for a VIDEO of this estate property! For more information on Center-Harbor amenities visit my Center-Harbor Information Page. Shown by appointment only. Feel free browse my website to view all Winnipesaukee real estate. 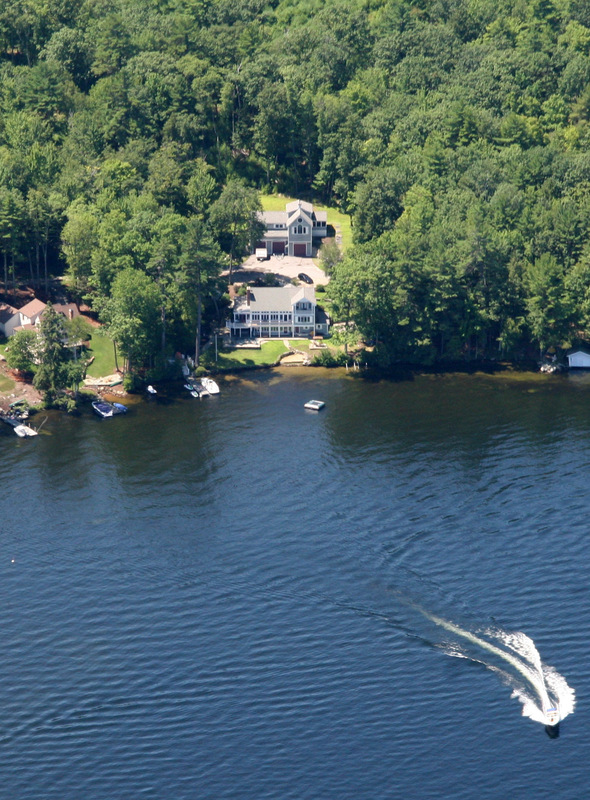 You can search all Winnipesaukee real estate by town.